1. The display shows the current time. 2. Once you throw the first coin in, the display will show until when your parking ticket will be valid. 3. Add as many coins as you like / as you like. The time display will continuously update the time according to your payment. 4. 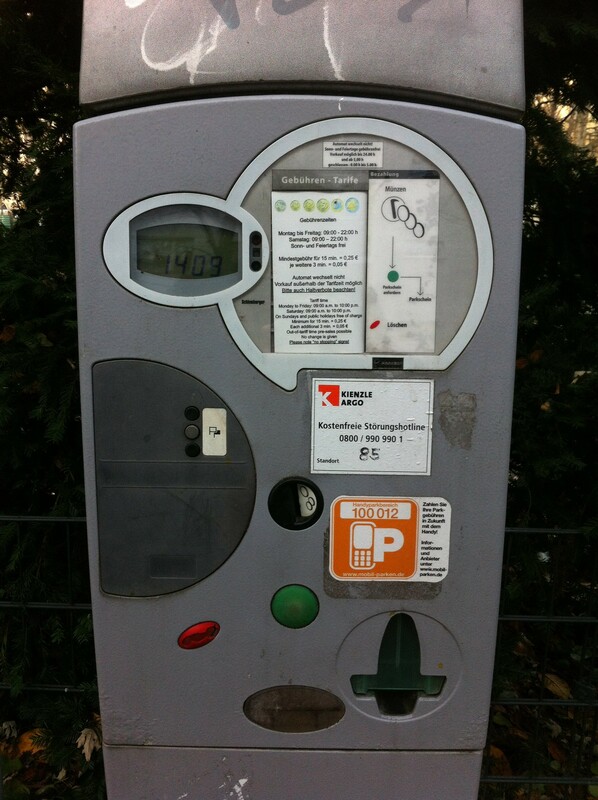 You can use almost all Euro coins: 2-Euro coin, 1-Euro-coin, 50-cents, 20-cents, 10-cents and even the 2-cent coin is good for buying parking time. 5. You can pay “in advance” – so if you park your car in the evening and parking over night is free of charge, you can already buy parking time for the next day / the next morning. 6. Once you think you paid enough you just need to push the big green button and wait for your ticket to be printed. 7. Be sure to place the ticket in the front window of your car so that *everybody* can easiely see it. I recently tried to pay my parking ticket with a debit card for the first time. I was first a bit skeptical about this – but then it worked just fine. I’m actually not sure, what kind of card you can use to buy parking ticket – but I guess it’s the “V Pay” printed on my card that does the job. Not all ticket machines offer this payment method – and not all machines work properly. It took me three tries to find a ticket vending machine that actually had the ‘pay by debit card option‘ AND actually worked. Once you insert your card in the slot, you can use the small buttons next to the slot to select the amount of parking time you want to pay. The machine I was using allowed 15 minute steps – which translated into 25 cent steps. Alternatively you can also purchase a parking ticket using your mobile phone by sending an SMS (text message) to a special number. Usually you can find that number on the side on the ticket machine. In the above picture the sticker with that number is however attached to the front.I haven’t tried that payment option yet – so I’ll add the info as soon as I know if and how it works.